ESG stands for Environmental, Social and Governance. It is a broad term, covering the analysis of investments by metrics other than traditional financial ones. It has also been the stand out trend in the investing world over the last five years. ESG analysis represents a different way of at looking at companies and reflects the growing awareness that there are consequences of being a shareholder or owner of a business (other than receiving dividends), as well as a broader understanding that purely financial metrics only catch part of what a financial analyst should be looking at. In this article, we review the rise of ESG, the impact on funds and investment trusts, and the various ways ESG has evolved in the fund world, before taking a look at which investment trust managers incorporate ESG analysis in their management process. The past few years have seen the term 'ESG' become increasingly ubiquitous across the investment universe, and more and more investors seem enthusiastic to embrace it as a concept. Google searches for 'ESG investing' have risen rapidly over the past decade, with a compound annual growth rate of 73%, almost double that of 'passive investing' (42%). Source: Brown Brothers Harriman & Co.
As a result, managers have been reacting. According to the February 2019 Global PwC survey, 91% of the respondents now have ESG policies in place, or in development, and of these 78% now use (or are developing) strategies to track, evaluate, and report improvement towards their responsible investment of ESG policies. As a measure of the interest in ESG funds, Morningstar conducted a study of US exchange trades and open-ended funds that either stated that they consider ESG criteria as part of their investment processes or indicate that they pursue a sustainability-related theme. Funds that sought to achieve a measurable sustainable "impact" alongside financial return were also included. 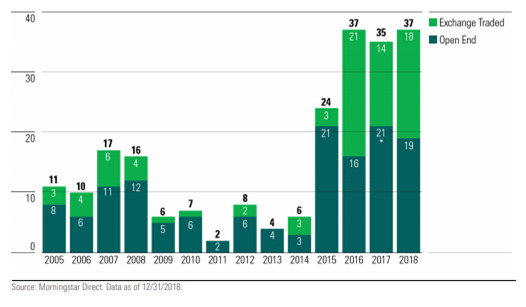 They found that at the end of 2018 there were 351 open-end and exchange-traded sustainable funds, an increase of 50% over the previous year. At the same time, 63 existing funds added sustainability /ESG criteria to their prospectuses, up from 32 in 2017. 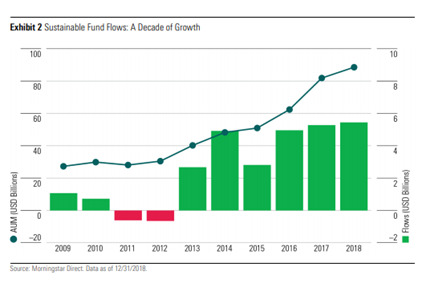 The graph below also from Morningstar shows that that in the US, sustainable funds attracted record net flows in 2018, the third consecutive row of record flows. This is even more impressive when one considers the context of the unfavourable and volatile market conditions that year. Morningstar statistics show that average annual net flows in 2013–18 were more than 30 times greater than in 2009–12. Clearly, ESG is a force to be reckoned with, and managers and/or fund investors that chose to ignore the movement risk being left behind. With this said, there continues to be considerable ambiguity over what exactly ESG means. ESG encompasses a wide range of strategies and objectives, and as we examine below, it can be interpreted many different ways – from sustainable investment, to [being part of risk management of "traditional" investing], and involve "negative screens", or expected to provide positive "impact". We look at the various different definitions, and how ESG is incorporated into investment processes and how it is measured, before examining the measurable benefits that ESG investing can offer investors. Within this analysis, we look at the various applicable investment trusts, and how different managers of trusts employ ESG within their respective mandates. ESG: What is it and how can it be incorporated? As we note above, ESG stands for Environmental, Social and Governance, and each represent different criteria against which investors can assess companies for investment outside of the usual financial metrics. ESG is a term that is often used synonymously with "responsible" or "sustainable" investing but as can be seen below, it actually encompasses a wide range of areas. These three elements are often factored into investment processes and decision making to different degrees. Although they are not traditionally part of financial analysis, they may have financial relevance over different time periods. However, it is worth being clear that, in contrast to philanthropic or "social" investment, the defining characteristic of ESG investing is that the end product is to invest in financially successful businesses, and profit from them. Meeting high ESG standards means that from an objective standpoint, a company may be considered more sustainable (lower case s, from an investment longevity perspective, depending on your outlook), as well as being more Sustainable (with a capital S - from a marketing/ positioning standpoint with customers). Each of the above objectives has optimal strategies with different elements to them depending on the analysts overall objective. Inevitably some of these strategies cross over the various categories. According to a seminal review by the Global Sustainable Investment Alliance in 2016, the largest ESG investment strategies around the world are negative/exclusionary screening ($15.02 trillion), ESG integration ($10.37 trillion) and corporate engagement/shareholder action ($8.37 trillion). With this said, the popularity of each strategy varies depending on the region. So whilst negative screening was the largest strategy in Europe, ESG integration was the most popular strategy across the vast majority of the rest of the developed world. On the other hand, corporate engagement and shareholder action were the most dominant strategies in Japan, perhaps reflecting the particular history and corporate culture of that country. What are the benefits of ESG? It is often thought that in order to incorporate ESG practices fully into investment selection, one must forgo (or dilute) investment returns. However, numerous studies have suggested that ESG practices can in fact offer investors greater financial returns. Research published by Friede, Busch and Bassen (2015) aggregated over 2000 empirical studies looking at the relationship between ESG and financial performance for a blend of portfolio and stock-specific studies. As far as our research efforts are concerned, the study can be considered by far the most comprehensive summary of research on the area. The findings showed that in around 90% of the studies that they reviewed, the researchers found that there was no negative relationship between ESG and financial performance. More encouragingly, the majority of studies reported positive findings – corroborating the fact that incorporating ESG analysis DID improve performance. An adjunct to their conclusion was that the positive impact ESG had on performance appeared to be relatively stable over time. More recently, Amundi Asset Management (2019) looked at the performance 1,700 companies from January 2010 to December 2017. Their research found that using ESG criteria to screen companies was beneficial when looking at portfolio returns but had little impact on portfolio risk. The research also illustrated that 2014 was a turning point for ESG as a selection strategy. Prior to 2014, ESG investing hindered both passive and active investors, yet from 2014 onwards ESG investing was a key source of outperformance across Europe and North America. One other finding was that ESG did not impact all stocks equally, but the effect was most pronounced with the best or worst-in-class most likely to be impacted (positively or negatively). It is possible to hazard that this effect has been caused by the growing demand from investors of all types for an ESG approach, which will in turn produce flows into best-in-class stocks and boost the overall price and performance. Both Morningstar and the MSCI have also produced research on the performance of ESG funds. 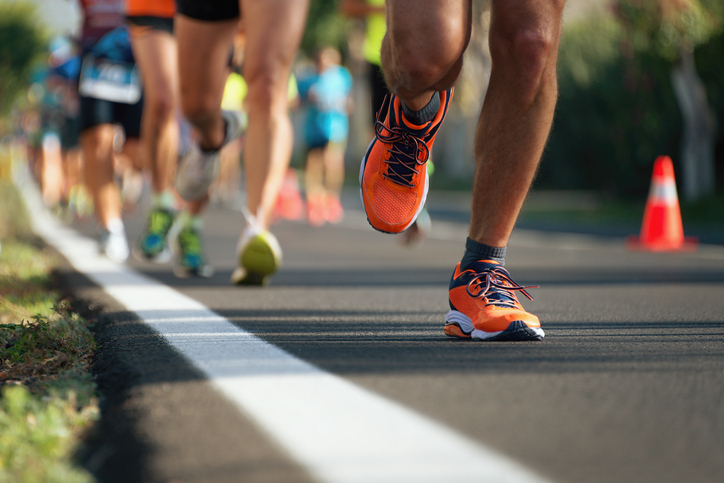 Looking at the US, the most recent Morningstar Sustainable Funds U.S. Landscape Report showed that last year saw 63% of the U.S. sustainable funds sit in the top half of their respective Morningstar sectors, including 35% in the top quartile. Impressively, only 37% of the sustainable funds ended in the bottom half, with just 18% in the bottom quartile. This data does include fixed income and alternatives, however as can be seen below the percentages were about the same for equity-only funds. Looking over the longer term, over three years, 57% of sustainable funds rank in the top half of their categories and over five years, 58% rank in their category's top half. MSCI took a slightly different approach to looking at the influence on performance of ESG practices. Instead of Morningstar's correlation based research, they instead looked at how ESG characteristics lead to "financially significant effects". Cash-flow channel: High ESG-rated companies are more competitive and can generate abnormal returns, leading to higher profitability and dividend payments. Idiosyncratic risk channel: High ESG-rated companies are better at managing company-specific business and operational risks and therefore have a lower probability of suffering incidents that can impact their share price. Consequently, their stock prices display lower idiosyncratic tail risks. Valuation channel: High ESG-rated companies tend to have lower exposure to systematic risk factors. Therefore, their expected cost of capital is lower, leading to higher valuations in a DCF model framework. The transmission channels were tested using the MSCI rating data, as well as financial variables. For the Cash-flow and idiosyncratic risk channel, the companies that scored highly on ESG metrics typically showed higher profitability, higher yields, as well as lower idiosyncratic tail risks. They also found that high ESG-rated companies were less likely to display systematic volatility, low values for beta and higher valuations. The results of the study led the researchers to conclude that there was a causal relationship between ESG and financial performance. They also believe that using ESG rating changes could be a valid financial indicator and they coined the metric 'ESG momentum'. How do analysts measure ESG? As we have discussed, ESG analysts are looking for companies that participate in supporting social, governance and environmental challenges, alongside good financial returns. However, the obvious question is 'what is the appropriate way to measure whether a company is incorporating ESG practices or not?' This is a difficult question to answer, least of all because of the lack of standardization in the terminology. Providing a foundation for uncovering ESG friendly companies, the United Nations Sustainable Development Goals (SDGs) recognised 17 ambitious development goals which the MSCI have grouped into five actionable "impact" themes. These can be seen below. The purpose of the SDGs and impact themes was to quantitatively analyse which ESG areas companies have revenue exposure to. From this MSCI developed the 'ESG Quality Score', which looks the risks and opportunities for companies due to large scale ESG trends (e.g. climate change or demographic shifts) as well as due to the nature of the company's operations. The MSCI ESG Ratings method looks only at issues that would considered 'material' for each sector and they employ a quantitative model to uncover measurable impacts. After any company specific overrides are inspected, companies are given a final score which corresponds to a rating between AAA (the best) and CCC (the worst). Alongside the MSCI Rating, the other main rating system is Morningstar's Sustainability Rating. Similar to the MSCI ESG Quality Score, the rating measures how well the underlying holdings in a portfolio or fund are performing on ESG issues relative to a peer group. The rating is derived from a three-step method. Firstly, the Morningstar Portfolio Sustainability Score is calculated. This is the asset-weighted average of underlying company level ESG scores (taken from Sustainalytics), with deductions made for controversial incidents within any underlying companies in the portfolio (such as environmental accidents, fraud, or discriminatory behaviour). Next, Morningstar take a a weighted average of the past twelve month's portfolio scores, where more-recent portfolio scores are more heavily weighted than older portfolios. Finally, a Morningstar Sustainability Rating is assigned for a portfolio depending on a comparison to its Morningstar category average. Funds are given absolute and percentage rankings and within these peer groups. We applied the Morningstar Sustainability Rating system across the 474 strong Morningstar AIC investment trust universe and uncovered some interesting themes. Our first finding was that many management houses have similar ratings across their trusts. For example, Schroders who have eight trusts across numerous sectors, were all rated "average" or higher in their respective categories. Similarly, of Janus Henderson's 22 trusts, only one was rated below average relative to peers. On the other hand, eight out of Ballie Gifford's nine investment trusts rate "low" or below average relative to their peers. Only one of Invesco's 14 trusts was considered "above average" relative to their respective peers. What we believe this illustrates is that Morningstar's analysis must to some extent incorporate how well ESG is involved in a management house's investment process. In the graph below, we show the major investment managers and how their respective trusts stack up relative to one another as regards Morningstar's ESG ranking. we assign a trust a +1, 0 or -1 depending on if they were rated above average, average or below average. Another key theme we extracted from the data was the impact from the average market capitalisation of investment trust's portfolio. As can be seen below, every large cap sector has greater ESG ratings relative to their mid/small cap counterparts. The highest ranking sector is European Large caps, which was on average 20% better rated than the rest. Be that as it may, there are a few clear flaws in the rating systems. First of all, there are inconsistencies among the different providers. SRHub, a data provider for the sustainability industry, calculated in July 2018 that the correlations between the MSCI and Sustainalytics for ESG ratings are only 0.32 – meaning that one or other must be "wrong". Morningstar have recently tried to rectify a few of the more obvious flaws by including historical data and increasing size of peer group, however many remain prevalent. The most commonly recognised flaw is the bias which we illustrate against funds investing in mid and small-cap stocks, who are likely to have more limited disclosure on ESG issues. For example, Royal Dutch Shell (LSE:RDSB) have plenty of resources to devote to producing data on its ESG practices, whereas a smaller renewable energy business might be hindered given the lack of IR resource to produce data about itself. Alongside this, the best in class approach presents flaws. For example, by only comparing oil companies to other oil companies, a company drilling wells in the rainforest is potentially able to have a higher ESG score than the laggard in the sustainable energy peer group of companies. The metrics don't consider absolutes. The final flaw with the metric is that it does not appear to take a fund manager's engagement with portfolio company boards into account. As we touch on above, investors increasingly see fund managers engaging on governance issues with their investments as one of their key ESG / fund manager responsibilities. The ESG scores fail to account for this entirely, which for most investors we speak to is a grave omission, given this is viewed as an increasingly important component of what investors look to managers for. Undoubtedly ESG has been an area that has gained a lot of attention, and the importance placed on it is only likely to increase in the coming years. Companies that choose to ignore the movement risk being left behind by their peers, and this has been shown in the reactions of investors to the Morningstar sustainability ratings. According to Amman et al. (2018) the average fund that gained a high Morningstar ESG rating saw a 0.45 percentage points per month greater net flow than an average-rated fund, and a 0.78 percentage points per month higher net flow than low-rated funds. An increasing number of metrics and ESG measures are now adding new dimensions to financial analysis and portfolio holdings are now under even greater scrutiny by fund investors. Having said that, even basic level analysis is still relatively patchy, which will create unintended consequences. For example, of 263 equity investment trusts only 156 of them have been assigned a Morningstar ESG score. Of these trusts, the average percentage of each portfolio covered by the Sustainalytics is 88%. Even then, there continues to be a degree of definitional vagueness surrounding ESG investing, and as we have pointed out, there are flaws in many of the measurement metrics. The two major rating classifications from Morningstar and MSCI have a correlation of just 0.32 (CSRHub 2018) illustrating the difficulty in defining and quantifying ESG. Other quirks from the statistics are that some of the more "obvious" trusts that should (in our view) score relatively highly, only attract an "average" score. Examples include Impax Environmental Markets (LSE:IEM) and Jupiter Green (LSE:JGC) . We believe this is likely to be the case because trusts are measured against a wider (global) fund peer group, which may include very niche funds or be subject to other biases which distort the relative scores (ie large-cap exposure). Indeed, looking at the table below, suggests that European portfolios score more highly than most, given they are very much over-represented in the top twelve trusts in absolute terms. Certainly, the likes of IEM and JGC, which have ESG scores of 50 and 52 respectively, do not mark them out as particularly strong scorers compared to the wider investment trust universe, which currently has six trusts which score above 60. Henderson EuroTrust (LSE:HNE) is perhaps a surprising winner on ESG scoring. The trust aims to deliver superior total returns from a portfolio of high quality European (ex UK) investments, with the portfolio becoming increasingly concentrated with the new manager having taken over recently. James Ross believes that the way companies respond to ESG issues can affect their business performance, both directly and indirectly. As such, the statistics corroborates the managers claims that ESG is fully bedded into their investment process. It is worth noting that Henderson is one of the leaders in the ESG investment space and was a founding signatory to the United Nations Principles for Responsible Investment. The Principles offer managers an outline for incorporating ESG issues into investment decision making practices. Job Curtis' portfolio at City of London (LSE:CTY) scores well on Morningstar's analysis. Job comments that he "definitely prefers companies with high standards of corporate governance and good quality accounts", but he doesn't take an overly prescriptive view of what sectors or industries a company is exposed to. City's objective is to produce long-term growth in income and capital and he aims to have a portfolio yield typically 10% to 30% above the FTSE All Share Index yield. To achieve this he has a diversified portfolio with no sector restrictions - the portfolio currently includes stocks in the oil, mining, tobacco and defence sectors as well as many others. In terms of engagement, Henderson votes at all investee company meetings. Janus Henderson's Corporate Governance Manager, Antony Marsden, consults with Job on controversial issues, such as executive compensation where Job wants only genuine long-term performance to be rewarded. Schroder Income Growth (LSE:SCF) has a concentrated portfolio of around 40 stocks which comprises of mainly UK companies that offer sturdy dividend yields. Sue Noffke, the manager aims for an above average yield and real-income growth ahead of the rate of inflation via a relatively unconstrained stock picking approach. ESG plays an important role at Schroders, and it has been integrated across their entire investment process, from identifying trends, analysing securities, constructing portfolios, through to engagement, voting and reporting. They have specific ESG analysts, each with their own sector focus and this allows them to gain a deep understanding of sector-specific ESG issues and identify and assess ESG risks and opportunities. Engagement with companies is a key part of their investment process and they consider themselves active investors. IP Select's Global Equity Income is managed by key members of each regional team in Invesco's Henley office (a committee known as The Global Equity Income Group). The team aim to achieve a growing level of income return each year, with capital appreciation over the long term, through a concentrated but diversified portfolio of global equities. The manager looks to invest in high-quality companies at attractive valuations, offering appealing yields, sustainable income and capital upside. Invesco Perpetual have been committed to responsible investment over the past few years and incorporate ESG practices across all areas of the company. This includes through their investment strategies, products, proxy voting, active ownership, engagement and other oversight practices. Active ownership is a particularly important aspect of ESG for Invesco, and their investment managers always look to maintain discussions with management, promoting decision making that is in the best interests of shareholders, and is in accordance with good corporate governance principles. Proxy voting is a strong indicator of this and can be a useful mechanism to drive responsible investment. During 2017, Invesco voted in 99.6% of meetings in 72 markets globally. Securities Trust of Scotland (LSE:STS) and Martin Currie Global Portfolio (LSE:MNP). Securities Trust of Scotland is a broadly diversified global equity income portfolio looking to deliver a rising level of income and long-term capital growth from a diversified portfolio of equities. Mark Whitehead took over the portfolio in 2016, and since then the trust has produced returns largely in line with its peer group benchmark. In comparison, Martin Currie Global Portfolio (LSE:MNP) aims to achieve long-term capital growth, in excess of the FTSE World index, whilst offering solid income for investors. The company looks to grow capital over the long term, whilst offering solid income for investors. The portfolio has just 34 holdings, and the top ten holdings making up over a third of the portfolio. Both trusts are part of Martin Currie, who have a differentiated ESG approach and combine integrated ESG analysis and active ownership. Looking at ESG factors have been an integral part of their stock research since 2009. Any information gathered is exposed to peer review, and the manager looks to build an investment case through qualitative analyses and company valuations. The team believe that there is a strong relationship between the governance of a company and their financial returns, as such active ownership is an important aspect of ESG for Martin Currie. STS scores 58, and MNP 57 on Morningstar's ESG scores, both of them "above average" relative to peers. As we suggest above, Impax Environmental Markets (LSE:IEM) has historically been "pigeon-holed" as one type of ESG fund. Certainly within the investment trust sphere its longevity (nearly 18 years) and size (c. £500m market cap) mean that it is seen as the bellwether for the AIC's "Indirect – Environmental" sector. In our view, this is a rather narrow definition of IEM, which needs to be seen more as a global small and mid-cap technology and innovation fund. ESG analysis is fully embedded in the fund management process, but we believe IEM is a good example of a fund in which the principles, aims and objectives of ESG are fully reflected in the investment philosophy as well as the fund's investment objective. Somewhat against expectations, it scores only 50 on Morningstar's ESG analysis, and relative to "peers" is considered average. Menhaden (LSE:MHN)'s core aim is to generate long-term profits for shareholders by investing in opportunities that deliver, or benefit from, the efficient use of energy and resources. Menhaden also attempts to quantify, to the extent possible, the positive impacts of its listed portfolio companies. Each year it analyses avoided resource consumption (electricity, fuel, water and waste) and the greenhouse gas emissions avoided due to its portfolio companies' products and services. Menhaden hasn't been awarded an ESG score by Morningstar, perhaps because only 58% of its portfolio is scored by Sustainalytics. We believe many investors are under the misconception that it is a "green" fund, aiming to save the world rather than deliver good investment returns. Having met with the management team, we believe the philosophy can be better described as using a "value" focus to identify durable companies, with strong pricing power and very high barriers to entry, aiming to remain invested for the very long term. It currently trades on a very wide discount of 24%.